Looking at taking a break this Easter? Look no further! To help you make the most of your trip (and ease some of the pain of packing), we’ve put together a list of the ‘essentials’ for our visitors. Whether you’re a keen hiker or Sunday stroller, we’ve got a walk that’s perfect for your pace! Choose from rural, coastal, or urban terrain – we guarantee the best views and plenty of clean, fresh air! Want to bring the whole family on your Easter break? We have lots of walking routes, parks and beaches that welcome dogs where they can run and swim to their heart’s content, including the award winning Rhossili Bay where they are allowed all year round! Some of our accommodation operators and restaurants are also dog friendly so doggies get to dine out too! Whether you’re experienced, an amateur or a beginner – Gower’s a great place to start your surfing journey. When the surf’s good, just head for the beaches – Llangennith and Langland are two of the local favourites! No room to bring your board? Don’t have a board? No clue what you’re doing? Check out our local operators who will be more than happy to help! We know that pictures tell a story – tell us yours! Tag us into your Insta posts (use @visitswanseabay) and share your best bits with your fellow Swansea Bay fans and use #SeaSwanseaBay so we can see them too! You might need your beachwear this Easter, you might not (we suggest layers!). We can’t promise you warm weather but we can guarantee some of Britain’s best beaches. From quiet, hidden gems, to family-friendly and activity-packed, you’re sure to find your perfect beach getaway. Unspoilt scenery, seclusion, fascinating wildlife, and breath-taking views guaranteed! We have plenty of free-from-traffic cycle routes and are part of the Celtic Trail and National Cycle Network. Cycle along Swansea Bay’s 5 mile Promenade, grab an ice cream or ride around some of the quieter roads on the North Gower cycle route. No room to bring your own bike? 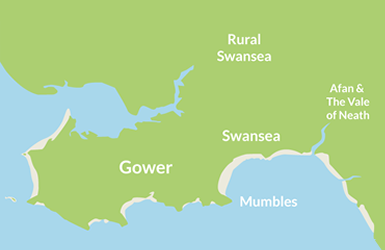 No problem – you can hire a bike from 6 hubs across Swansea Bay with Santander Cycles Swansea – by App, Phone or the Bike Computer.